Carlisle high heat one-half size food pan. Reinforced top and bottom corners on both pan and lid help prevent chipping and cracking. Spoonable bottom makes removal of contents easier and helps prevent food waste. Molded-in capacity indicators are listed in both quarts and liters. Textured non-slip finish on corners, sides, bottom and lid reduce scratches. Smooth interior finish makes clean-up easy. 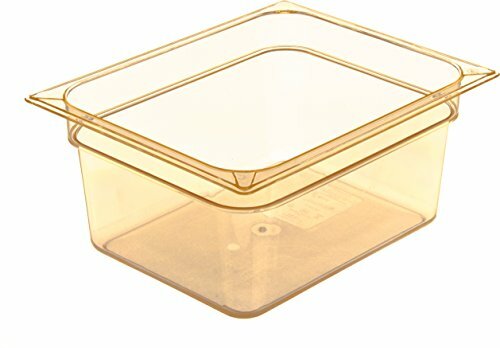 High-heat pans excel in high temperature applications and are BPA free (-40 to 375 degrees F). Food pan size meets specification for use in food bars and steam tables. Pan meets EN 631-1 Euro Norm Standards for inter-stacking with existing pans. NSF listed; dishwasher safe. Made in USA. 8.7 quarts capacity. Amber color. Measures 12-3/4-inches length by 10-3/8-inches width by 6-inches height.